If you're growing orchids outdoors in warm climate, or have a greenhouse, Cattleya's can be among the easiest plants to grow. On the other hand, if you only have a windowsill for growing, cattleya's might be a challenge. Cattleyas are a wide, diverse group of plants that range in size from small windowsill plants to specimens that can grow up to 4 ft wide and over 4 ft tall! So if you're growing indoors, choose your Cattleyas carefully because those big, unruly plants that demand all your window space can be a problem. Cattleya blooms are relatively short lived, lasting only several days (as opposed to phalaenopsis blooms that can last for several months). 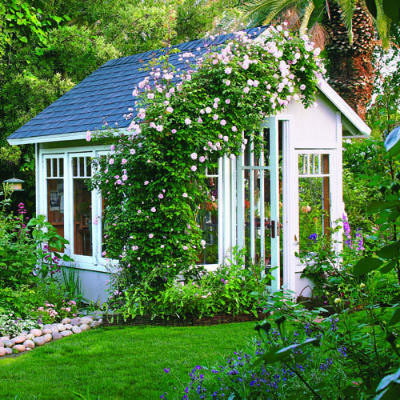 Many varieties make up for this by showing off their blooms several times a year. There is no single season when Cattleya flower. 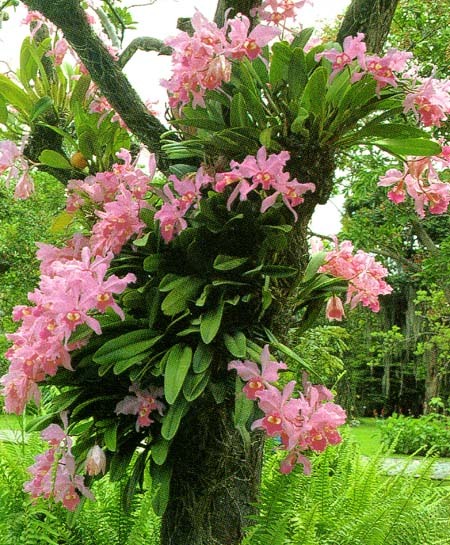 In nature, Cattleya grow as air plants (called epiphytes) high in the trees of the tropical forest. Their thick, fleshy roots anchor the plant to the tree while collecting rain water from the occassional shower. Their root system is exposed to the elements and endure long dry periods between rain showers. Cattleya roots need lots of air or they will rot. Our hydroponic system is ideal for growing cattleya because LECA pebbles drain quickly and spaces between the pebbles promote maximum air flow to the roots. LECA pebbles are also perfect for outdoor growing because they're ceramic and will never breakdown or decompose. That means healthy roots - and less repotting - no matter what type of weather. 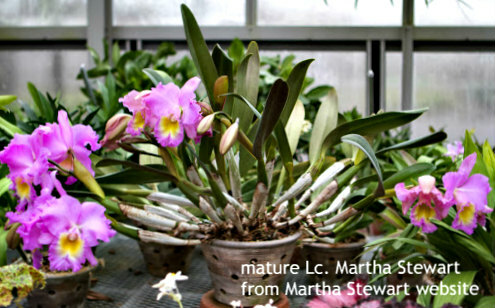 Plant care for Cattleya orchids varies with their seasons. During their active growing season (usually summer) they demand strong light and copious amounts of water (up to 3 times as much!). On the other hand, in their resting season their metabolism slows and and they want only enough water to keep from dehydrating. Finding a good "place to grow" for these plants is imperative. Lots of light and cool temperatures at night are the two main requirements. This means a window that gets a couple of hours of direct sun. They're also excellent candidates for outdoor growing during the summer months. Growing under lights is also a good option. When flowers appear, move plants away from the hot sun to prolong the life of the blooms. After blooms have faded, return plant to its growing area. Don't try to force new growth - these plants have their own internal calendars. Your plant could be dormant for several months before the growing season starts. If your plant has been growing well for several years without producing a bloom, it's almost always too little light and/or to warm at night. Cattleya's need strong light - with some direct sun. Their leaves should be rigid and medium to light green in color. If the leaves are dark green and floppy, your plant isn't getting enough light and it will refuse to bloom. On the other hand, if the leaves are hard and yellowish the plant is probably getting too much sun. 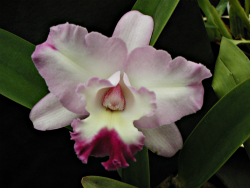 Indoors Cattleya prefer the spot nearest an east or west window. Without additional lighting, north facing windows just won't do. Cattleya's thrive outside on the patio during the summer months. Remember, aways protect your plants from the hot mid-day sun outdoors. To establish an accurate watering schedule, make sure system is completely dry before rewatering. This could be up to a week after the gauge reads empty! Always error on the "dry side" with these plants. Don't be too concerned about hitting the exact day - established plants are very forgiving in our system. Cattleyas grow in a wide range of temperatures. To perform best, they need temperatures that range from 55 degrees at night and up to 90 degrees (or more) during the day. They need at least a 15 degree difference between day and night temperatures to bloom. With their thick leaves and stems, Cattleya orchids are one of the better performers in low humidity. Remember, all orchids need at least 30% humidity levels however. With proper light, water, and temperature range, these plants will reward you with vibrantly colored blooms - and many are fragrant!